Educational architects and facility managers are increasingly reaching out to us to help them better secure the physical aspects of their schools. We therefore developed VC-EFS to incorporate all the key elements of optimally safe privacy and shading solutions for windows, doors and side lites in educational environments. MONTREAL, Canada – September 25, 2018– Unicel Architectural, manufacturer of vision and daylight control solutions, today introduced its Vision Control® Educational Facility Safety (VC-EFS) solution to meet a growing demand for building products that enhance the safety of students and personnel in schools and other educational facilities. VC-EFSis a patented, hermetically sealed glass unit combining louvers within high impact glazing or polycarbonates that can be customized to virtually any shape for interior and exterior glazing applications. 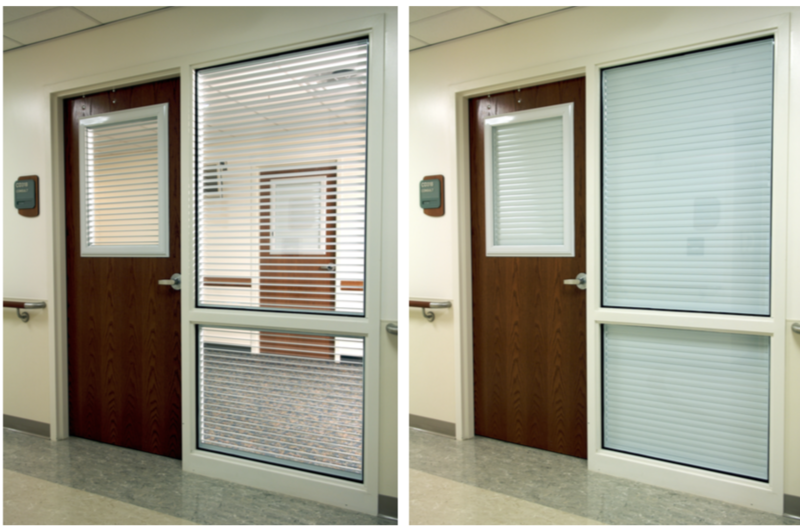 Its advanced louvered glazing technology eliminates strings and cords, ensures alignment and requires no maintenance. High-impact glazing and polycarbonatesfor bullet, impact and shatter-resistant protection. This also eliminates the risk of dangerous glass shards while maintaining the louvers in a sealed and protected hermetically sealed airspace. Hollow extruded aluminum louverswith an interlocking profile of up to a ½ inch thickness. The unique hollow-chambered louvers provide maximum strength to the spacer and maintain the parallel alignment of the blades for complete vision blocking and protection. This is important as the louvers efficiently block visibility in closed position, as compared to blinds that leave gaps allowing intruders to obtain partial visibility. Corrosion-resistant aluminum pivots, pinions and racksmade of UV stabilized material to ensure stability, durability and protection. Removable operators such as keys or crank handles for enhanced facilities control. Electrical control mechanismsthat permit the opening and closing of integrated louvers from a remote location. Sound dampening 2“ and 2.5” airspaces, coupled with two glass lites of varying thicknesses, provide sound wave barriers with an STC rating on par with concrete walls. Evidence indicates that shooters do not aim at what they cannot see. While visibility is important in schools for both interior and exterior windows, these windowed portals must be adjustable - permitting both open and fully blocked views - and strong enough to withstand violent impacts. Where blinds can often fail by getting tangled and misaligned, VC-EFS louvers are designed to ensure fast and reliable function at any time. Privacy solutions should also be remote controllable and significantly reduce noise for safer, calmer environments. VC-EFScompetently addresses all these school safety design requirements.